An inguinal hernia occurs when internal soft tissue, usually part of the large intestine, protrudes through a small tear in the lower abdominal wall underneath your skin. Inguinal hernias often cause a noticeable bulge and lower-abdominal pain that is sometimes described as a bellyache. Inguinal hernias usually require surgical repair, although juice fasting may reduce the amount of pressure on the lower abdomen until you receive appropriate medical attention. On the other hand, too much juice may cause bloating and aggravate your symptoms. Ask your doctor about safe home remedies for inguinal hernias. The inguinal region is considered part of the groin, although it borders the lower abdominal area. Inguinal hernias occur when part of the abdominal cavity protrudes through a tear in the inguinal canal, which encloses the spermatic cord in men, or the ligament that helps stabilize the uterus in women. Inguinal hernias occur underneath the skin, although they can be easily seen as a bulge. These hernias are usually caused by a preexisting weakness in the abdominal wall or from increased pressure within the abdomen, which can be caused by obesity, pregnancy, straining during bowel movements and heavy lifting. Inguinal hernias are much more common in men, according to MayoClinic.com. Some inguinal hernias don't cause any symptoms, but usually you can see and feel a noticeable bulge on one side of your pubic bone that becomes more obvious when you stand upright. Other symptoms might include a burning or aching sensation in the groin and lower abdomen, difficulty bending over or lifting, diffuse inflammation and abdominal weakness, according to the “Textbook for Functional Medicine.” It’s usually a segment of the large intestine that pokes through the tear in the inguinal canal, so reducing intestinal pressure may be of some benefit. Juice fasting involves consuming nothing but fruit and vegetable juices with water for a few days or possibly up to a week. Conventional medicine doesn’t view juice fasting as beneficial or even particularly safe, although limiting your fast to a couple of days and keeping well-hydrated shouldn’t put your health in jeopardy. 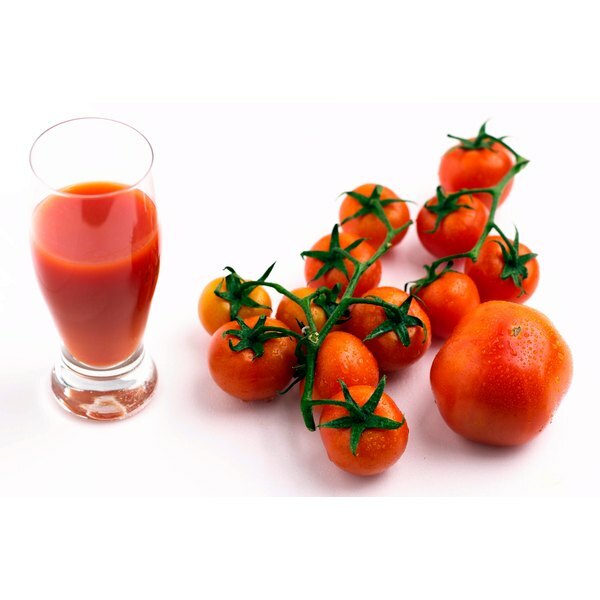 Fruit and vegetable juices are rich in vitamins and minerals but usually poor in amino acids, protein and essential fats. Without bulky food traveling through your intestines, less pressure may be exerted on your inguinal regions, which could reduce your symptoms. Too much juice, especially if you are unaccustomed to consuming much fruit, may actually cause severe abdominal bloating and aggravate your hernia symptoms. Sorbitol in fruit is often the culprit. Sorbitol is a sugar-based alcohol naturally found in small amounts in apples, pears, peaches, prunes and some berries. It is metabolized very slowly by your body, which provides a substrate for the fermentation of bacteria, according to the book “Human Metabolism: Functional Diversity and Integration.” The fermenting bacteria produces gas, which causes abdominal bloating, flatulence and bellyaches. Consult with a nutritionist about the potential side effects of juice fasting.